Sprouting is the practice of soaking, draining and then rinsing seeds at regular intervals until they germinate. Sprouts have long been famous as "health food." A recent research shows that in addition to being a powerhouse of nutrients, they also protect us against various diseases. 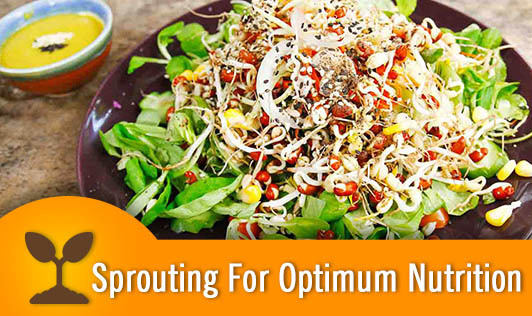 1.More Nutrients: Sprouts deliver fiber, antioxidants, vitamins and minerals in higher amounts. A study shows that sprouting enhances antioxidant properties that help in fighting cancer cells and boosting the immune system. 2. Easily Digested: Sprouts contain enzymes for growth, which aid in digestion. 3. Economical: Not only are sprouts good for your health, they're good for your wallet, too. All you really need is a container, some seeds and a little water. Once sprouted, the seeds will continue to grow like an indoor garden, and require minimal care. 4. Organic: Sprouts you grow yourself at home are organic that contain no pesticides, synthetic fertilizers and chemicals. 5. Growing sprouts offers you versatility. You can have more varieties of salads. Apart from sprouting pulses, grains and nuts, greens like lettuce, alfalfa, Chinese cabbage, purple turnip, fenugreek, wheat grass and more can be grown. Your salads will come alive! 6. Decreases the calories: Sprouting process of grains, legumes, seeds not only increases the nutritive value but also reduces its calorie and carbohydrate content (for a given volume) thereby making it an ideal food for weight watchers. Have a cup of sprouts daily to remain healthy and cheerful. Happy Sprouting!